Our hair is the crowning glory of our looks, both literally and figuratively. Long, gorgeous, and healthy tresses are every girl’s dream, but most of us end up hating our dull and lifeless hair. Owing to our hectic, modern lifestyle, which includes everyday stress and pollution, long hair can be difficult to achieve. Maintaining long and lustrous hair is not a one day task. It requires a proper and dedicated hair care regimen that is easy to follow. If you’re dreaming of long locks like Rapunzel’s, here are a few tips you must follow. Catagen – When the lower two-thirds of the hair is destroyed. Telogen – When the hair enters the resting phase waiting to be pushed out by the fresh strand growing in the follicle. The last phase ‘telogen’ is when the hair falls out. Around 10 to 15% of our hair is in its last phase. But due to various factors, sometimes a majority tends to jump to the telogen phase. This is when we face hair loss problems and hair thinning too. After applying hot (warm) oil on the scalp, gently massage the scalp with your fingertips. Apply oil to the strands of the hair. Let them soak in the goodness of the oil. You may also wrap a hot towel around the head for 10 minutes to help in the better absorption of the oil into the hair. Wash off after one to two hours with a mild shampoo. You will note evident results post your first usage. Oils enriched with herbs give your hair strength and stimulates blood circulation. Together it helps you grow thicker hair. We can never deny the importance of a good hot oil head massage, which is one of the best-known home remedies for long hair. A good ‘champi’ is the best thing for our hair. Get it done at the parlor, by a family member or friend, or do it yourself. We know finding the right shampoo and conditioner is a big task. Brands are also misleading at times. Many times, these shampoos and conditioners do more harm than good. Here’s what you can do to save yourself the horror. Replace your branded shampoo and conditioner with homemade shampoo and conditioner. Here is a quick recipe for starters. Before sharing the recipe, let me give you two reasons (from an otherwise huge list) as to why you should try this homemade shampoo. Mix both ingredients in equal measure into the container. Keep repeating the process till the container is full. Squirt the liquid gently onto the scalp and hair. Massage the scalp well to remove all dirt for a minute or two. Follow it up with a thorough rinse. This conditioner is unconventional and simple. You might not get a creamy texture like the ones available in the markets. But try it for just one reason – its effectiveness. Mix equal amounts of both ingredients into the container. Keep doubling the amount till the container is full. Use a squirt bottle for ease in both storage and usage. Squirt a little conditioner onto your palms. Using your hands, massage it well onto your hair. Make sure you apply it only from midway to the bottom of your hair. Do not apply it on your scalp. Our hair, like the rest of the body, needs that extra attention to stay youthful and healthy. It requires pampering once in a while. And this is why deep conditioning is a must. Here is an easy hair mask recipe. After a shower, slather on the mask and wrap a towel around your hair for 20 minutes before washing it off. 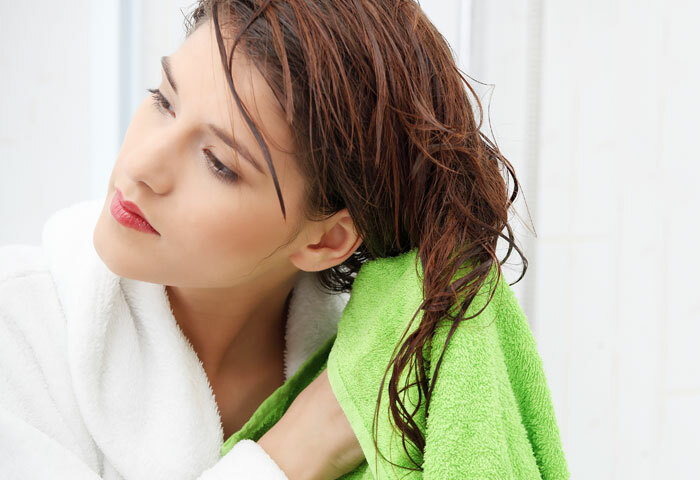 Wash off thoroughly with a mild shampoo and let your hair dry naturally. A super steamy shower can be rough on your hair and can leave it rough and dry. Rinsing with cold water, on the other hand, helps to seal the cuticles and strengthen your shafts, thus helping your hair grow longer and maintain its health. Drying your hair roughly using a towel increases the chances of breakage. Choose a gentle towel or an old t-shirt, pat your hair dry using it, and then let it air dry for some time. Wet hair tends to stretch more and break easily as compared to dry hair. So avoid brushing while your hair is still wet. If you wish to detangle it, use your fingers, and gently work through the tangles. Using right products can add volume to your hair. Make sure you use products that are formulated especially for this purpose. Regular use, over time, will see a good change in your hair strength and quality. Here is a list of products that you may try using for adding volume. While these products are really good to use, you can also try a homemade alternative. Homemade products are not only good to use but pocket-friendly too. So don’t just sit there in amusement, start noting. Just the way yeast adds volume to bread dough, the yeast present in beer adds volume to your hair. You sure must have heard of beer as a great conditioner, but it is equally good as a volumizer. And your hair volumizer is ready to use! The results will be just as amazing as any other volumizing leave-in conditioner available in the market! Certain colors, when added to the right layers and sections as highlights, can give an illusion of more volume. Find a stylist who is good with highlights and get your hair highlighted to add volume. It is always advised to use a wide-toothed comb for your hair. Once your hair is dry, start combing your hair from the bottom, and then work up gradually. This will prevent unnecessary hair fall. Pulling the hair constantly and carelessly will lead to physical harm to your hair. Boar bristle brushes are also good for distributing the scalp’s natural oils down the hair. Brush your hair twice a day. Remember to brush before bedtime. This will ensure that the blood circulation to the scalp is good when you are sleeping (we all know that our hair grows the most while we are sleeping). 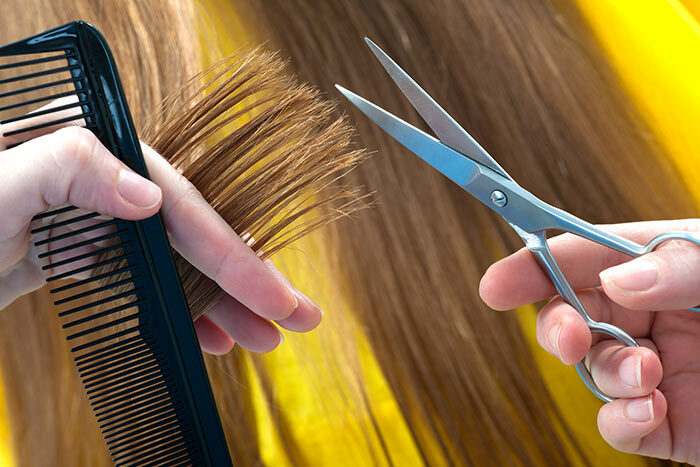 Snipping your hair more often helps in faster hair growth and removes split ends. Regular styling and pollution make your hair prone to split ends and damaged cuticles. Trimming the lower portion of your hair every six to eight weeks is always advisable as it ensures that the damage is minimum, and this promotes the growth of healthy hair. Ditching cotton pillowcases and opting for satin fabrics will keep your hair healthy and hydrated. Since satin and silk fabrics have a softer surface, they cause less friction as compared to cotton fabrics, and thus, you wake up with fewer or no tangles at all. The biggest culprits behind damaged hair are hot tools. Stop over-styling your hair. Instead, adopt a few natural methods to curl and straighten your hair. 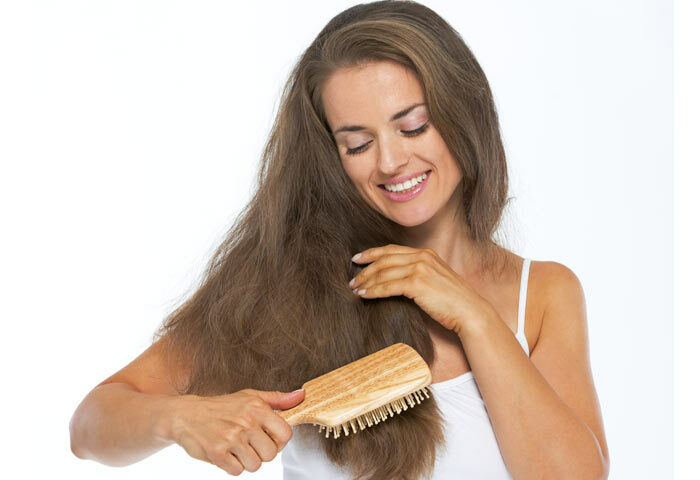 Excess heat damages hair, period. Using too much of styling products, chemicals and heat are main reasons for hair loss. It reduces the thickness, and the hair loses its sheen, making it appear dull and dry. Avoid using straightening/curling machines. Try and limit blow drying your hair. If you have to straighten or curl your hair, try using natural methods that are less harmful and damaging. While traveling or while going out in the sun, keep your hair covered as far as possible. Covering your hair will protect it from the harsh sunlight and damaging pollution. Ponytails and similar hairdos look awesome, but tight hairstyles cause stress on the roots, and the friction leads to breakage. Try different and loose hairstyles. Vitamin E is extremely good for hair and has been an essential ingredient in body lotions, shampoos, and conditioners. Use it individually or mix it with coconut oil and apply it to your scalp. Chemically loaded shampoos, conditioners, and styling products can have adverse effects on our hair in the long run. Their build-up and prolonged exposure are bad for your hair and overall health. Use mild shampoos and conditioners. Herbal remedies and treatments are very effective in promoting hair growth. We spend a lot on costly products that may or may not give the desired results. You can use ingredients like egg, honey, aloe vera, coconut milk, amla juice, vinegar, etc. for hair care. These ingredients keep your hair healthy, strong, and chemical-free. You can make your own hair rinses at home and apply them regularly. Here are a few effective home remedies for long hair. This is a simple home remedy to grow your hair. Take the ingredients in a bowl and mix them to make a paste. Massage the pack into the scalp. Keep the hair pack on for 30 minutes and wash off with cold water. Along with the mask mentioned above, try adding an egg with 1 tablespoon honey and 1 tablespoon virgin coconut oil. You can also use olive oil instead of the coconut oil. Make this into a paste and apply the mixture to the scalp and hair. Leave this on for 45-60 minutes and wash it off after that. After a protein mask, you may use two tablespoons of apple cider vinegar mixed with a liter of water to wash off your hair. Use the mixture as a rinse and after using shampoo to wash off the remains of the shampoo from your hair. Protein masks are excellent for obtaining healthy hair. This is a very good hair mask that promotes hair growth. The components also render shine and smoothness to hair. Take a banana in a bowl and mash it. Do away with all the clumps. Now take an egg, honey, and beer, and mix them all with a fork along with the banana. The mixture should be a smooth paste. Use this mixture on the scalp and along the length of your hair as well. Now tie your hair up in a bun and cover the head with a shower cap. Leave the mixture on for at least an hour or 1.5 hours. Rinse with cold water. The egg and the banana give nourishment to the hair. The honey moisturizes it, and beer is known to give volume and thickness to the hair. Grate the onion and squeeze out the juice into a container. Apply this on the scalp and then follow up with a generous massage with honey. Leave the hair mask on for 30 minutes and wash off. Onion is very helpful for hair growth. 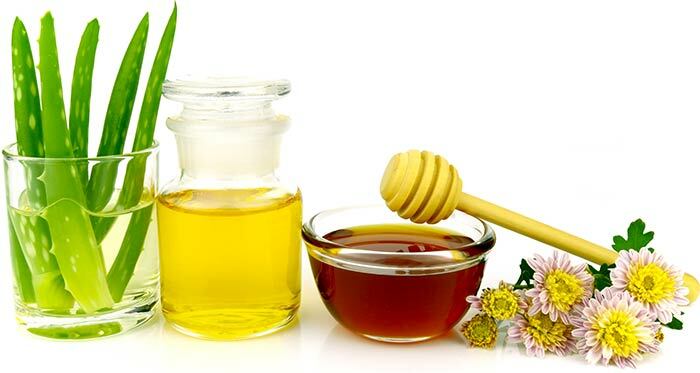 Honey deeply moisturizes the hair and the onion juice stimulates the hair follicles. For best results, do this massage every day for a month. Add curry leaves (chopped) in oil and let them boil for some time. Apply this to your hair for long and strong hair. You may also add an egg to this mixture to get extra softer and silkier hair! Applying this to hair also reduces graying. A mixture of Honey, Olive oil and egg applied to hair gives it strength and makes it grow longer. This is definitely an awesome recipe! Apply jojoba oil for 20 minutes before going to the shower. This promotes fast hair growth too! Almond, Castor, Olive and Jojoba oil mixed and applied to your hair and scalp makes it softer, silkier, and longer like never before! Shikakai powder mixed with Amla powder and water when applied to hair, conditions, strengthens and makes it longer. I bet you know about this from a very young age, don’t you? I got this from a very old neighbor- Add hibiscus flowers to water in a bowl and leave it for 2 hours. Remove the flowers and rinse your hair with the water. It makes hair soft and definitely helps to grow your hair. Add Arhar dal to water and let it remain for 12 hours. Remove the dal and wash your hair with the water. It will repair your damaged hair and will make it soft and silky and in the long run, it will make your hair longer. Apply any oil (mustard oil for example) to your hair after warming it. This also promotes healthy hair growth. Add fenugreek to some coconut milk and apply this to your hair. Leave it for 40 minutes. Wash with a gentle organic shampoo. This makes hair longer. Apply normal yogurt to your hair and leave it for 30 minutes. After that, rinse your hair with lukewarm water. This recipe is a very old one and many old people still use it, and you can use it to for longer and stronger hair! The application of aloe to any part of your body works wonders. You can apply it directly to your scalp overnight and then wash it off, or you can even mix it with coconut milk and wheat germ oil to use as a shampoo. Drop the aloe gel in your coconut oil, heat it up and keep it in a bottle. Doing so will add more benefits to your weekly oiling routine. Even if you orally consume it as a fresh juice, it will most definitely reduce your hair fall and give you shiny and lustrous hair. This is as traditional as it gets. Coconut oil is sworn by every granny in our country. The only trouble is that you need to be patient and consistent with this method. All you need to do is massage this into your scalp and leave it overnight before you wash. Over a period of time, your hair will most definitely look stronger and feel healthier. But, make sure not to leave your hair too oily with coconut oil like most women do. This can make your hair look flat and gross, and the excess oil will absorb all the dust it comes in contact with and does more damage than good. This awesome wonder can be used in three ways. You can boil the dried pieces in oil and bottle it up like you would with the aloe Vera. You can apply and leave it overnight before wash your hair. You can also boil the pieces in water and then use that water to rinse your hair. You could also dry the gooseberry, make it into a powder and keep it bottled. Mix it with some water and apply as a hair mask to the scalp an hour before wash. This can help add strength and bounce to your hair. Although beer is not “exactly” all natural, it does work wonders for your hair. You can use it in two ways. You can rinse your hair in beer or turn it into a shampoo. If you’re looking to use it in your shampoo, then all you need to do is heat the beer in a saucepan at medium heat till comes down to 1/4th the amount you poured in and then mix it with your shampoo. You can use it the same way you’d use any shampoo. Just apply, lather up and rinse off. The way to gorgeous hair is actually through your vegetable garden and your kitchen. Not at the bottom of countless hair products. Try out these numerous hair recipes for getting better hair. 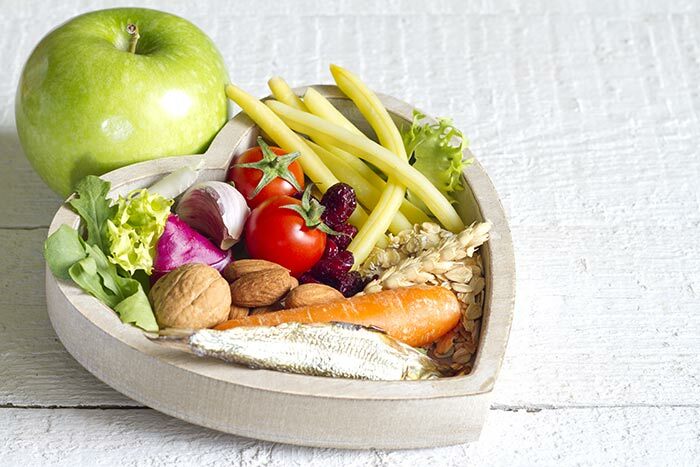 A proper diet is the key to a healthy body and mind, and your hair is no exception. Here are a few things you can include in your diet for healthy hair. Protein intake helps to speed up the process of hair growth and makes your locks strong and lustrous. Coconut and dry fruits are very good to enhance hair growth. They also make your hair bouncy and voluminous. Include green leafy vegetables, fruits, sprouts, nuts, and curd in your diet. Vitamins play a major role in maintaining the growth of hair and cuticles. Try to consume as many vitamins as you can in the form of fruits, especially citrus fruits. Our body must be hydrated enough to maintain the water levels as dehydration can lead to dry skin and scalp and lifeless hair. Try to consume as much water and fluids as you can. Drink plenty of water and exercise regularly. These help in improving the blood circulation to the scalp, in turn, promoting hair growth. Excess hair fall and fast hair thinning, both are indications of poor health. It is also an indication for you to start eating right. Pay more attention to what you eat. Include more of Vitamin A, B, C & E-rich foods in your diet. Protein, iron, and zinc must also be included. Vitamin E is particularly essential for hair growth. Consult your doctor to prescribe Vitamin E tablets for you. Vitamin B complex has 3 different vitamins. These vitamins too can be of great aid in hair growth. Last, but not the least, stress can have adverse effects on our body. 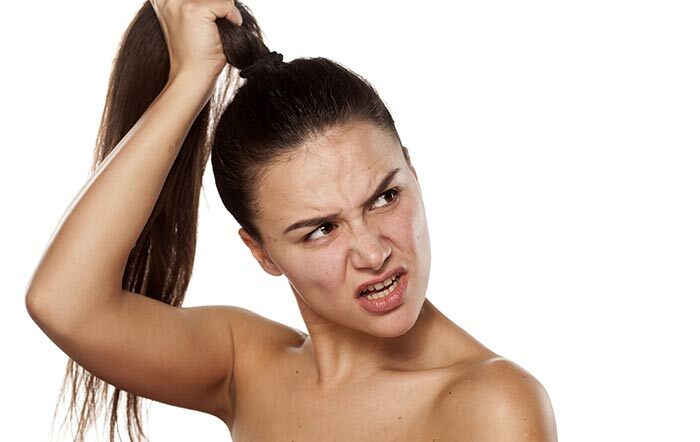 Stress can lead to hair loss as well as reduce hair growth rate and make hair unhealthy. A proper seven to eight-hour sleep is important for hair growth and to keep our body healthy and stress-free. Gelatin encourages hair growth. You can intake gelatin supplements in the form of capsules. Also, using dry gelatin in your daily sauces or drinks will do the trick. Don’t worry, it will not ruin your favorite dishes as it is odorless and tasteless. Now that you know how to get long hair naturally, what are you waiting for? Apart from the above methods, it is also important to protect your hair from external damaging factors such as pollution, dust, excessive heat/ cold, direct sunlight, etc. When stepping out of the home, ensure you use a scarf/ dupatta to cover your head (and hair). The way we part our hair decides the look/length of the hair. Try parting at the middle. Middle partition makes your hair look longer. On towel dried hair, apply mousse to add volume as thick hair looks longer than fine hair. Blow dry by bending your head down. Concentrate on the roots. Once it’s done, use a round brush try to add waves to the ends. Turn the silky hair little messy by tousling it / teasing it. Styling your hair in loose waves provides an illusion of longer hair. This is an excellent evening look as well. Layered hairstyles have been popular for ages. Razor cut or step cut adds volume to the hair. Opt for one that gives you many layers. This hairstyle is extremely flattering for people with round and heart shaped faces. Sharp / loose layers add a level of sophistication. This look requires a little extra effort in styling to achieve that polished look. For a casual look, you can just air dry and tousle your hair a bit. You can also opt for side bangs.This will provide extra height and volume. When you want to color your hair, opt for the darker tones rather the usual highlights. Go for dark reds, plums, chocolate, etc. The dark highlights give an illusion of thick hair, which in turn makes them look longer. Wear hair in a messy ponytail. Part your hair into 3 portions and wear ponytails on each. Make sure the last partition is placed at the bottom-most part of the head. This look adds a lot of height and volume. This is an updo which suits casual as well as party looks. In the end, it is important to understand that all these tips work in conjunction with good hair care. It is important to maintain your hair post any chemical treatments. Following the tips mentioned in the article will ensure you have problem-free, long, and healthy hair. 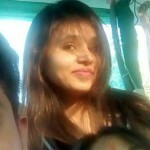 Any more questions related to home remedies for growing long hair? Leave a comment below. For an average human, the hair growth rate is one inch per month. And it could pace up or slow down depending on various factors like hair care, illnesses, hormones, diet, and genes. Hair follicles that rest under the skin of your scalp are responsible for the growth of your hair. Hair gets its nutrition from the blood vessels, thus good health leads to good hair. The hair growth cycle comprises four stages – anagen, which is the growing phase; catagen, the regression phase; telogen, the resting phase; and exogen, the shedding phase. An average person grows about one inch of hair every month. And that makes you realize how precious every inch is. Hair growth can be accelerated with proper care and a balanced diet. Vitamins that contain biotin, folic, and iron are beneficial for hair growth. What’s more important is a healthy diet because hair gets a major part of its nourishment from the blood vessels underneath the hair follicles. Oils like castor oil, jojoba oil, and avocado oil boost hair growth. Castor oil has vitamin A and Omega­6 and Omega­9 fatty acids that help retain moisture, accelerating hair growth. How long does the hair grow in a year? 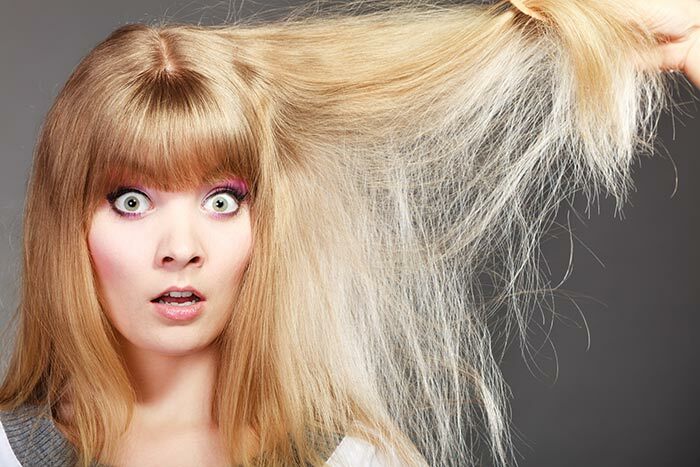 An average human being’s hair grows around 12 inches every year. This could be paced up to 14 – 16 inches with good hair care, regular oiling, massages, and healthy eating. Hair growth happens in 4 stages: anagen or growing phase, catagen or regression phase, telogen or resting phase, and exogen or shedding phase. At any given point, each hair could be in a different phase. When the hair goes from catagen phase to telogen phase before time, hair loss occurs. Proper nourishment through food and required vitamins can boost hair growth and add luster to your hair. Protein­rich food stimulates hair growth. It is advisable to include eggs and dairy in your daily diet. Vitamin A, biotin, folic acid, and iron are great sources of hair nourishment. You could get these from foods like salmon, cinnamon, curry leaves, spinach, oatmeal, nuts, lentils, lean poultry, guava, and fish. Consuming foods that include essential nutrients like zinc and Omega­6 and Omega­9 fatty acids are also beneficial for hair growth. Including fruits and green leafy vegetables in your diet will keep your body healthy, thereby providing the necessary nourishment to the follicles through the blood vessels. What nutrients are good for healthy hair? 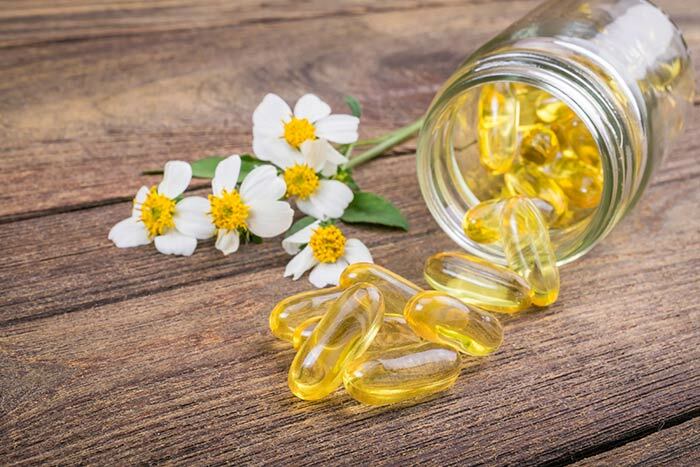 Out of all the nutrients that boost hair growth, the major ones are protein, iron, Omega­6 and Omega­9 fatty acids, Omega­3, vitamin C, biotin, zinc, selenium, and vitamin A. These nutrients reach your hair follicles though the blood vessels. Thus, eating nutritious food containing these nutrients is your recipe for long, healthy, and lustrous hair. Folic is also responsible for faster hair growth. Oranges are a natural source of folic acid. Other than food, a regular castor oil scalp massage keeps the scalp moisturized, preventing hair fall and premature graying of hair. What natural oils are good for hair growth? Castor oil is extremely beneficial for hair growth. It contains vitamin A and Omega­6 polyunsaturated fatty acids that pace up the hair growth rate. Castor oil is a humectant that attracts moisture from the atmosphere and transfers it to the hair follicles responsible for hair growth. The other oils that work wonders on hair are jojoba oil, avocado oil, and argan oil. For better results, it is advisable to mix these oils with castor oil and applying it. Castor oil mixed with coconut oil also adds luster to the hair and speeds up hair growth. Oiling the hair a couple of hours before a head wash is recommended.